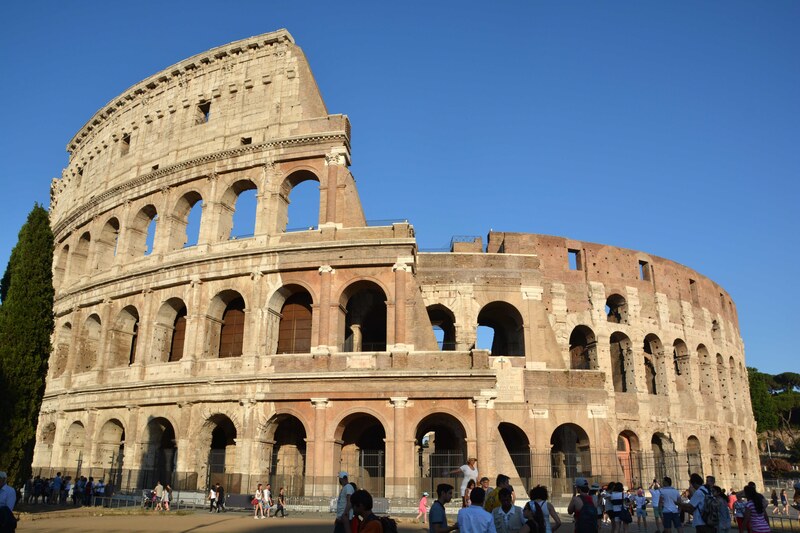 The Colosseum is in the middle of an extensive 25-million-euro restoration project financed by Tod’s shoe and bag empire. The first phase of the restoration, a thorough cleaning of the exterior, took three years and was completed last summer. The next phases will focus on shoring up the underground vaults, passages and drainage system and constructing a new visitor’s center. But you don’t have to be in the Colosseum proper to stumble on centuries-old remains. 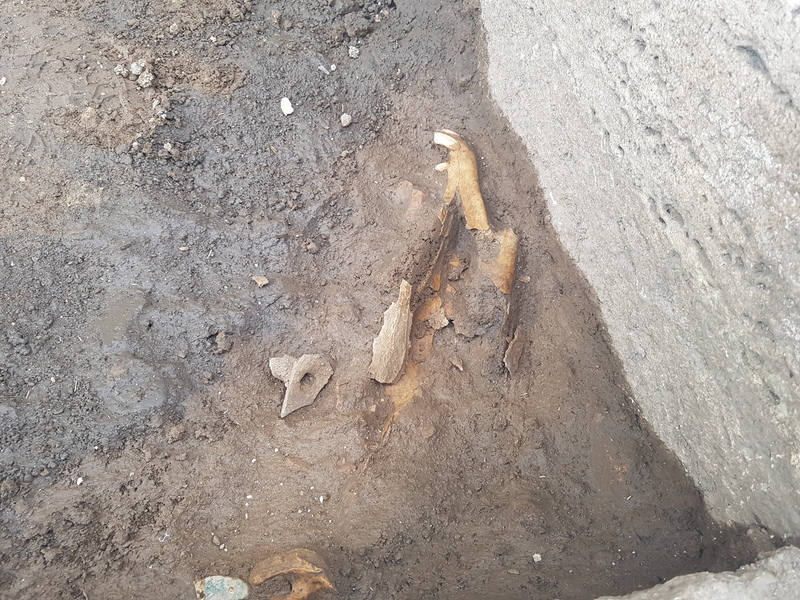 While cleaning the area around the steps around the amphitheater’s foundation, workers with the Archeology Superintendency discovered the skull of a horse buried just a few centimeters under the surface. An archaeozoologist dated the skull to the 12th or 13th century. 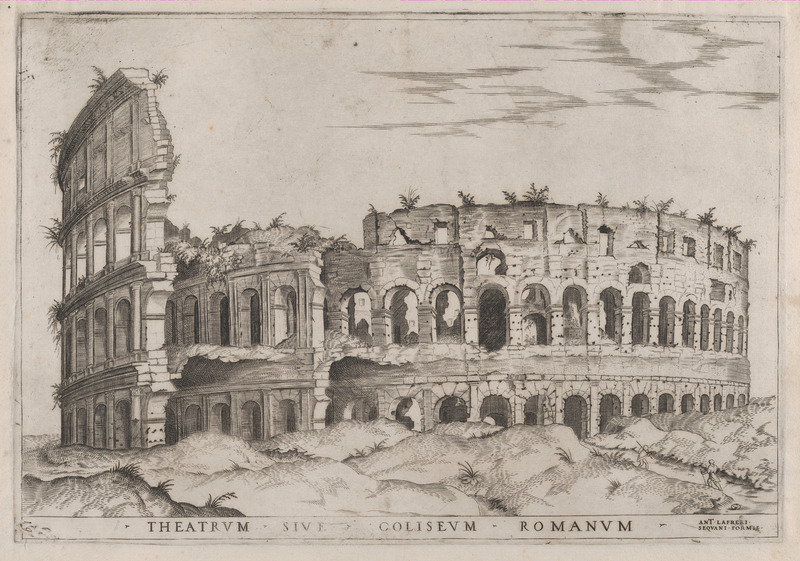 In the Middle Ages, the Colosseum was something of a mixed-used development. Until around 1180, the ground level vaults underneath the seating tiers were rented out as apartments and workshops by the church of Santa Maria Nova in the Roman Forum. But by then the state of constant warfare between the Roman nobility had made the Colosseum a strategic prize. Whoever controlled the Colosseum controlled the west and north access to the Pope’s residence in the Lateran Palace. The Frangipani family took over everything but ground floor interior, fortifying the structure by 1130. This was a direct threat to the papacy, which had very recent reason to be concerned. In 1119, Cencio Frangipani broke into the Lateran Palace, seized the newly elected pope Gelasius II, beat him and threw him in prison. The rioni of Rome revolted, and Frangipani was forced to free the venerable old pontiff. He forgave Cencio, but his successor Pope Callistus II did not. He had the Frangipani castle destroyed in 1121, thus making the Colosseum even more strategically important for them. Other Roman families were keen to get a piece of that action. In 1216, the Annibaldi family tried to build a tower near the Colosseum but the Frangipani blocked it. The Annibaldi changed course and took it to the Holy Roman Emperor Frederick II. The Frangipani were partisans of the Pope, so Frederick, who would be excommunicated no less than four times during his reign, was more than glad to fight the papacy by proxy through the petty conflicts of Roman nobles. In 1230, he compelled the Frangipani to give half the amphitheater, the half closest to the Lateran Palace, no less, to the Annibaldi. The pope at the time, Gregory IX, who would go on to call Frederick the Antichrist, was still smarting from the very sound spanking the Emperor’s forces had given to the army he sent to invade Frederick’s Sicilian kingdom in 1229 (while Frederick was on Crusade, no less). The enemies were temporarily at truce, so Gregory was in no position to fight battles over the Colosseum. This entry was posted on Wednesday, January 18th, 2017 at 11:59 PM	and is filed under Medieval. You can follow any responses to this entry through the RSS 2.0 feed. You can skip to the end and leave a response. Pinging is currently not allowed. Noble steed or horse kebab. Maybe someone traded his papacy in for a horse. ..Yee-haw ! I would sure like to dig around in there! 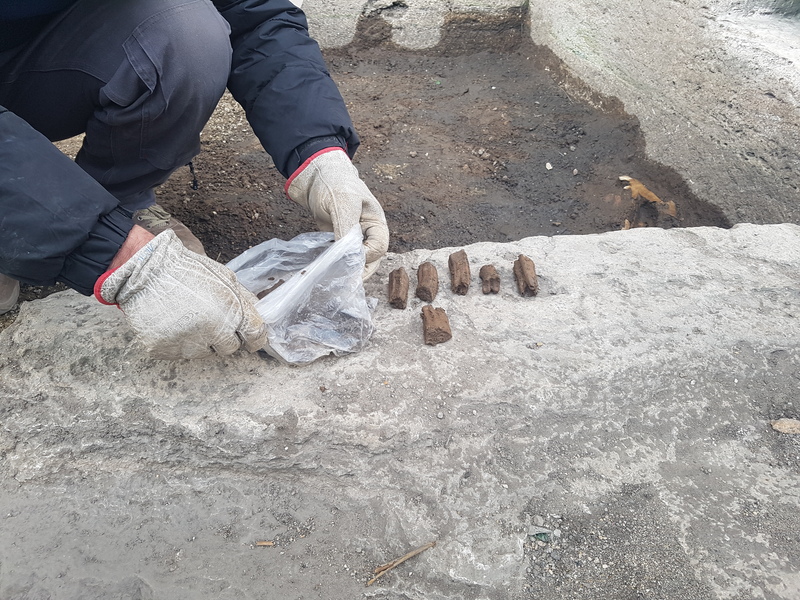 I bet they will find a lot more artifacts there. I’m just amazed at how many private citizens will use their funds to restore and protect the ruins of Rome. I’m not much into fashion but I hope that Tod’s Shoes and Bags shop gets a massive boost for paying for the restoration and a proper dig of the Flavian Amphitheater. More horses please, or whatever you find lying around.